MILWAUKEE, April 18, 2013 — The first practical application of “Anderson localization” — a Nobel Prize-winning phenomenon proposed in 1958 — has yielded a new method for transmitting light through optical fibers. Data transmission through conventional optical fibers — in which only one spatial channel of light traverses the fiber — is the backbone of the Internet. These single-core fibers are reaching the limits of their information-carrying capacity, however, said Dr. Arash Mafi, an assistant professor of electrical engineering at the University of Wisconsin-Milwaukee. To overcome this limitation, Mafi and doctoral student Salman Karbasi collaborated with Karl W. Koch of Corning Inc. in Corning, N.Y., to propagate multiple optical beams in a single optical fiber strand. They harnessed Anderson localization to create an optical fiber with a strong scattering mechanism that traps the beam of light as it traverses the fiber. The work has potential in next-generation high-speed communication and biomedical imaging, but it also opens the door for more uses of Anderson localization in technology. 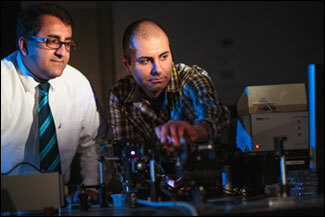 Arash Mafi (left), assistant professor of electrical engineering, consults with his doctoral student Salman Karbasi. Karbasi designed an optical fiber that traps a beam of light traversing an optical fiber in a unique way. The discovery could usher in the next generation of data transmission methods. Courtesy of Peter Jakubowski. Anderson localization is named after physicist Philip W. Anderson, who theoretically observed the curious containment of electrons in a highly disordered medium, an observation for which he shared the 1977 Nobel Prize in physics, but one that is still under investigation. The fiber design, created by Karbasi, consists of two randomly distributed materials, which scatter the photons. The fiber’s disordered interior causes a beam of light traveling through it to freeze laterally. The output light can follow any shift in the entry point’s location as it moves around on the cross section of the fiber. Karbasi said that his theoretical calculations indicated that the proper fiber design would take advantage of Anderson localization. “We designed our fiber so that it provides more physical places where the light can propagate,” he said. The collaborators are now applying the technique to form and transmit images. The research, backed by a grant from the National Science Foundation, appeared in Optics Letters. (doi: 10.1364/OL.37.002304).